Some roads in Scotland, especially in the Highlands and islands, are single track roads. A single track road or one-lane road is a road that permits two-way travel but is not wide enough in most places to allow vehicles to pass one another. To overcome this problem, many single-track roads, especially those officially designated as such, are provided with passing places. 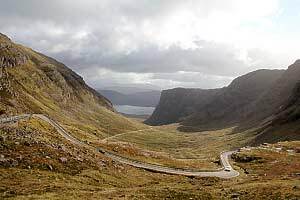 It is very well possible that you use these single track roads for the first time when you arrive in Scotland and most people from abroad have to get used to these somewhat ‘strange roads’. Some drivers can find themselves in difficult situations if they suddenly end up on a single track road and don’t know how to drive them. There are visitors who rent motorhomes and end up on single track roads without being able to reverse them properly. Some take things easy and drive very slowly, enjoying the landscape, but forget that behind them are people who make a living here without letting them pass. Such behaviour sometimes ends up in annoyed locals and stressed holiday makers, and is unnecessary if you read the advice about how to behave on these narrow roads before you drive them. Some of the paragraphs from the Highway Code below give some good advice which will help everyone to keep safe and happy on Scotland’s country roads. Take extra care on country roads and reduce your speed at approaches to bends, which can be sharper than they appear, and at minor junctions and turnings, which may be partially hidden. Be prepared for pedestrians, horse riders and cyclists walking or riding in the road. You should also reduce your speed where country roads enter villages. 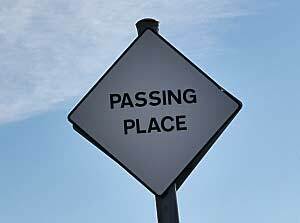 Many passing places are marked by either black and white poles at the roadsides or special square passing place signs, but some passing places are not marked. 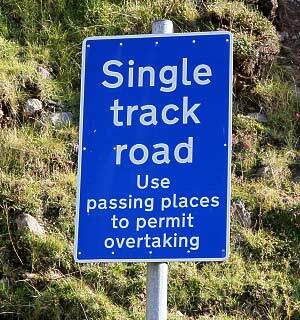 Drivers using single-track roads must be able to reverse to a passing place in order to let other vehicles pass. Sometimes drivers must reverse more than a metre or two. Driving onto verges to avoid reversing is not recommended, as cars may be damaged or get stuck in roadside ditches. 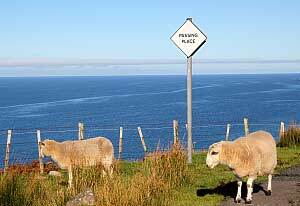 In Scotland it’s usual to give a friendly wave as ‘thank you’ if another road user has reversed or waited for you to pass. It makes all the difference!